A company's web site is often the first point of contact for any prospective customer; it is therefore a vital asset to any business or venture. Here at The Solutions Factory we believe that the design should be simple, clear and easy to read and navigate. We also believe that the design should be customer led. Your brand is unique and your website must reflect that. The Solutions Factory develops websites on PCs using HTML, PHP, ASP and .NET. Programs used include Macromedia Dreamweaver, Macromedia Fireworks, Adobe Photoshop. We have developed our own content management system which will give you full access to edit your website. Unlike other content management systems ours is lightweight and flexible and we can design bespoke applications to the site. We have also designed a unique multilanguage platform which is easy to update. Facilities that require pages to be generated automatically such as emails in response to contact requests are created using Active Server Pages. The site must be hosted at an Internet Service Provider who can support this. Websites today are not only viewed on a desktop monitor but also on a laptop, a pad and a phone, in the office, at home or on the move. Not to mention the different types of web browsers which could be used, such as Internet Explorer, Chrome, Firefox, Safari, Opera and many more. We can design the website so that it is responsive, that is easily read and navigated with a minimum of resizing, panning, and scrolling on any format or we could design the website for a monitor and also have a mobile only site, such as we currently use for The Solutions Factory website. The Solutions Factory is ready to build a cross-platform app, if your business requires it. Here are some examples of the websites that we have designed over the years. 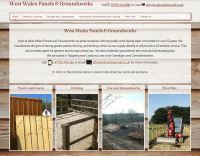 A community website, in Welsh and English. The contents covers everything from the history of the area to a business directory to an events diary. The website is fully responsive and is powered by our Content Management System. As part of our commitment to the communities of Llandysul and Pont-Tyweli, we volunteer our services to update this website with information. This local business based in Talgarreg manufactures fencing, panels, gates of all kinds for gardens and agricultural use. They also have over 35 years of experience in groundworks and landscaping. They have been using a Facebook and get a lot of feedback via that social media channel. The website is fully responsive and is powered by our Content Management System. This local group of volunteers have collected over 1000 images which they have uploaded to the People's Collection Wales website. However they wanted their own website for more information and which would link to their collection on the national website. The website is fully responsive and is powered by our Content Management System and is bilingual. The Ededa J is a ladies fashion shop in Newcastle Emlyn. They needed a website to show a taste of the collections which they have in their shop. This is a fully responsive webiste, powered by The Solutions Factory content managemen system and is bilingual. The Long Barn bunkhouse is available for large groups to hire at affordable rates. There are also two other units available to hire at this organic farm. The website is fully responsive and is powered by our Content Management System. Behind the scenes, the website also incorporates a booking system and the booked dates are shown on the Availability calendar on the public website. This is a neat and affordable option for small accommodation providers who want their booking calendar to be part of their website so they no longer need to use third party software which is often the case. The Pasold Research Fund provides grant funding for textile students throughout the world for publishing, workshops and research. The website is powered by our Content Management System. The website fully responsive so that it is easily viewed on all sizes of monitors, tablets and smart phones. The picture above shows the how the site is viewed on a wide device and the pictures on the left shows how the website is viewed on a narrower device such as a smart phone. The biggest difference is the menu, which changes from a horizontal menu to a drop down menu. A completely new design for Tysul Vets, Llandysul. We have used their logo with its sketches of animals as a bases the design as well using different shades of blue with orange to highlight. The website is powered by our Content Management System and is fully responsive. A little extra: When the site appears on a mobile phone it is possible to click on the telephone number and the phone will be able to dial it, if you wish. Which could be useful in an emergency. We have redesigned and updated the website for this Cumbrian based company. Using the Solutions Factory's own content managment system this website is also responsive. Both these Community Councils needed a website to fulfil their duties as public bodies. This company publishes B.A.R. - British Archaeological Reports and other. We initially developed an online database that could be maintained by Archaeopress. Today it has grown into a full ecommcerce website with a newsletter and forum. This company is based in Llandysul and the business has really taken off. This website is very busy at weekends especially on tablets and mobile phones. The website design incorporates a mobile design too. JonJu Tech wanted a very clean, simple looking website which is easy to navigate and is optimised for search engines. Originally this website used the Joomla CMS but we updated it to use our own Solutions Factory Content Management System. The Old Vicarage cottage is a three star self catering cottage in North Carmarthenshire. The cottage is surrounded by an acre of landscape garden created by the owners. It is essential that the website is thoroughly optimised for search engines as holiday accommodation in West Wales is incredibly competitive. Working in partnership with the owners the optimisation of hte website will be an ongoing process. Based in Australia , IPI produce inflatable packers for the use in various industries from geotechnical to drilling. This is the second version of the website which we have developed with IPI. This time we have used the Joomla! content management system which IPI administrators will be able to update whereever they are in the world, so long as they have an internet connection. The site is also available in Spanish. The Pwerdy, Pont Tyweli, restored for use as a community and arts centre will provide a variety of activities for local people, ranging from arts to IT to films. There is also opportunity of hire the building and its equipment. The website uses the open source Joomla! content management system which is easily updateable from any web browser by the client. As well as designing the website The Solutions Factory has set up the Twitter page and the Facebook fan page. Training to use the website, Twitter and Facebook was part of the package. Typoeth Cottage is a self catering holiday cottage not far from Llandysul. We used the open source Joomla! content management system to build this site so that the site owner is easily able to update the site whenever and wherever she wants to.